2. Was passive euthanasia the best way out? Saurabh was born two months premature on April 11, 1996. He was kept in an incubator for 21 days and in the beginning doctors advised his parents against announcing his birth, due to the unlikelihood of his survival. While Saurabh did survive, he was plagued with severe disabilities and was continuously ill throughout his childhood. 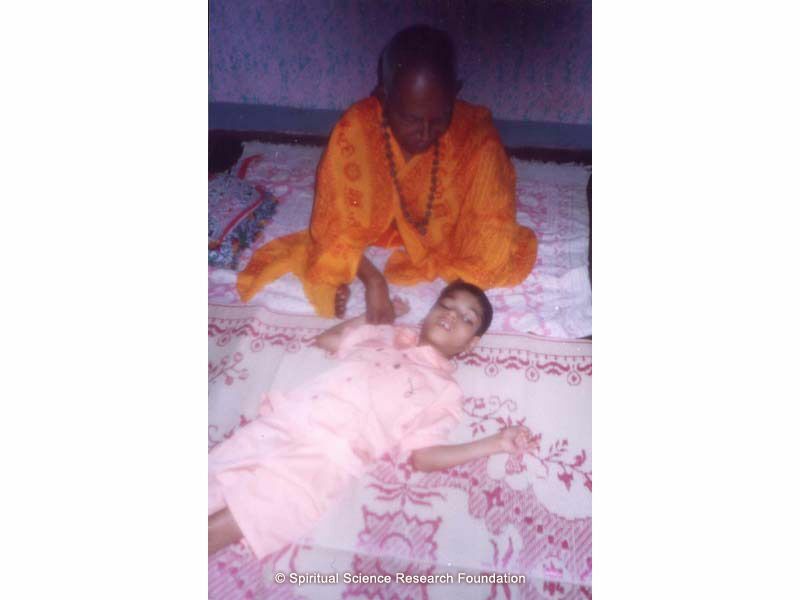 It was around this time that Saurabh’s parents started their spiritual practice under the guidance of SSRF. The years of looking after their son with no hope for the future took its toll on them. Saurabh’s parents were distraught and at their wits end as to what to do about their son. Was it worth letting him live? So severe were his disabilities that some well wishers even suggested passive euthanasia. Gurupournima : It is the day that seekers of God celebrate and honour the Teaching Principle of God also known as the Guru. On one occasion, around Gurupourṇimā 1998 (a yearly festival when the Universal Guru principle is most active), Saurabh lapsed into unconsciousness once again. When his parents took him to the hospital, the doctors said that nothing could be done and showed no inclination to attend to him. It was only after his mother prayed intensely that her prayers were answered and the doctors relented and admitted Saurabh into the hospital. Then for the next two weeks Mrs. Joshi spent many sleepless nights looking after Saurabh who was unconscious and showed no signs of recovery. As a result she was also not able to participate in the Gurupournima preparations along with other seekers of God. All of this took its toll on Saurabh’s mother and in a state of depression, she had a strong thought to give Saurabh an overdose of the medication that he was required to have for epilepsy. Immediately after having that thought, she had a vision of H.H. Dr. Athavale and He said to her, “Oh how can you have this thought? This child is a special child born of a higher spiritual level and such subtle-bodies are born only to complete their destiny.” The strangest thing happened after the vision ended. Instead of deteriorating, Saurabh recovered from his unconsciousness and ate heartily. The doctors who were responsible for Saurabh and did not know the reason for his state of unconsciousness were even more perplexed by his sudden recovery. Soon afterwards Saurabh’s parents met with H.H. Dr. Athavale and He said that God was looking after them and that is why He stopped the foolish act of the overdose of medication. Even prior to this event, they had a positive response to Saurabh from another Saint. They had taken Saurabh to Gagangiri Maharaj. At that time He was not speaking to anyone and had His eyes closed. When they approached Him to place Saurabh at His feet, He opened his eyes and motioned them not to. Instead He placed His hand on Saurabh’s head and said, “Om Chaitanya.” Then He looked at the Joshis and told them not to worry about their son. After this He went back to His previous state of keeping His eyes closed and not talking to anyone. With this new spiritual perspective, life changed for the Joshis. They began to notice the good qualities that Saurabh displayed throughout his childhood. Inspite of severe disabilities, Saurabh would always be smiling and even when ill he was basically a happy child. His face was always radiant and other seekers felt it was full of Divine consciousness (Chaitanya). Many forgot their sorrows after being in his company. There is an air of innocence around him and his demeanor is of quiet contemplation. Throughout his childhood, he rarely cried or asked for anything. Mrs. Joshi recounts that even if she fed him something that he liked and it got over before he was satisfied, he never cried for more. For a child with so many disabilities, Saurabh exudes patience and it feels like he is always living in the present. The above physical and psychological aspects of his life only reflect Saurabh’s spiritual temperament. He is happiest when in a sāttvik environment and he can perceive spiritually pure vibrations in a sattvik environment such as in a Temple, in the company of Saints or when listening to devotional songs sung by H.H. Bhaktaraj Maharaj. As time went by the physical disabilities continued to engulf Saurabh. Every time he falls ill, he takes at least one month to recover. His back and groin get sores because of continuously lying down and his inability to move his legs. An old thigh fracture does not allow him to sleep in a straight position. Since 2005 he has been sleeping on one side so his spine and waist are bent. The femur (thigh bone) has begun to travel into his pelvic region so there is a mismatch in both his leg lengths. His neck is long and he cannot control it and his organs continue to be weak and prone to infections. 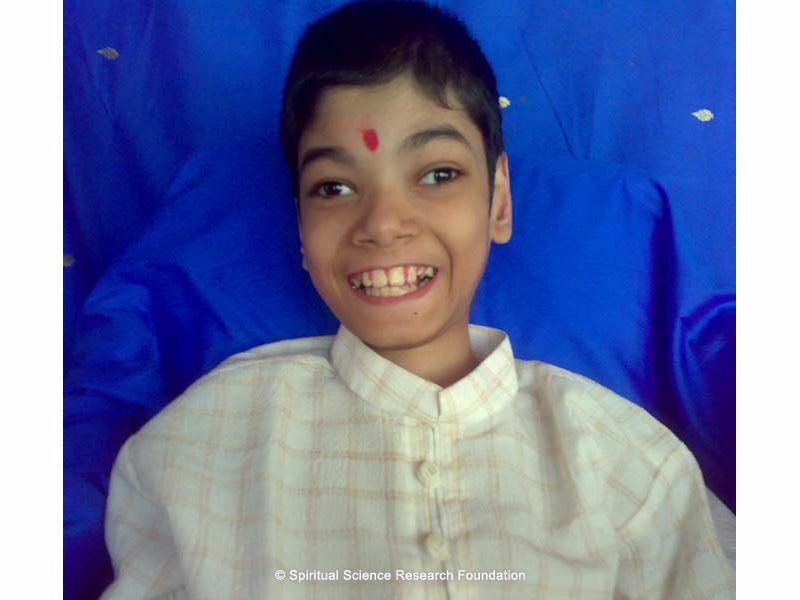 Yet because of Saurabh, his parents have been blessed with many spiritual experiences. On his 8th birthday, they took him to pay respects to three Saints. Through the day they met separately with H.H. Yogiraj Dr. Raj Ahmad Shah Patelbaba, H.H. Tulsidas Maharaj and H.H. Parulekarbaba. Even though the three Saints met with Saurabh separately and did not know that the other Saints had met Saurabh, all three of Them were very pleased to see Saurabh. All three of Them uttered the same words in Marathi, “Sadhu Sant yeti ghara, tochi diwali dasara.” Translated it means, “it is a festival day when seers come home.” All three of Them did not want Saurabh placed at Their feet but instead blessed him with Their hands. They also told his parents not to worry about Saurabh. From this the Joshis saw firsthand that while Saints may look different and come from different places, They are all inspired by the same thought from God. The next day H.H. 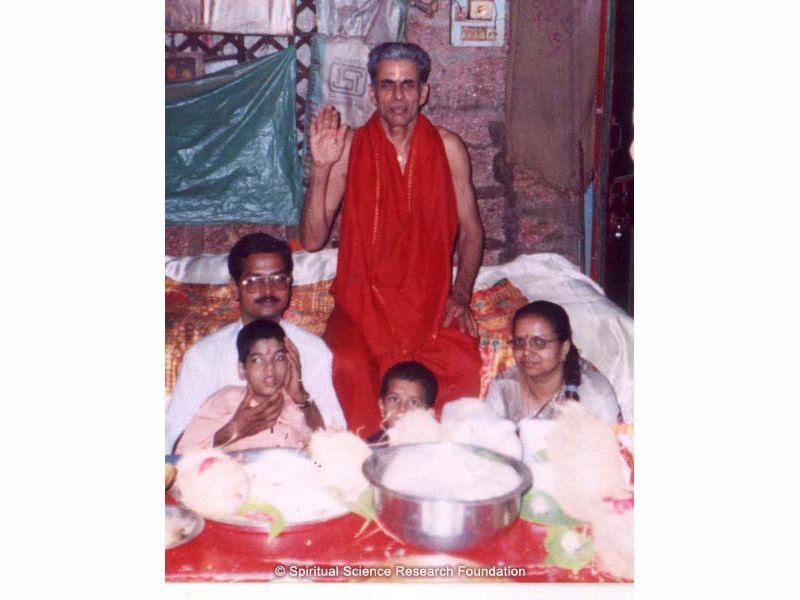 Raghuvir Maharaj came to their home and upon narrating the previous day’s story, He also said that He was feeling the same Bliss on seeing Saurabh. 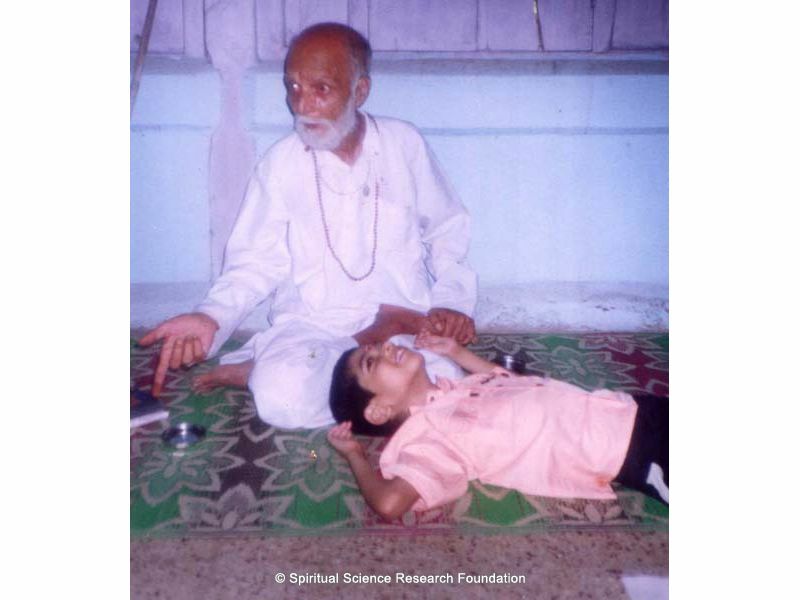 Later through SSRF many more details of Saurabh’s spiritual life were unfolded through spiritual research. Sometimes high spiritual-level subtle-bodies are born as trees, born with disabilities or behave like mad people. 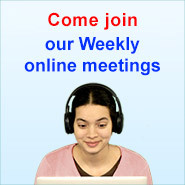 This is so that they are not disturbed and continue with their spiritual practice. On one occasion, H.H. 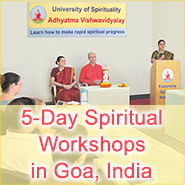 Dr. Athavale revealed to them that Saurabh practiced the path of meditation in a past birth. As a result he was born in this life at the 50% spiritual level. Due to some mistake in his past birth, Saurabh was forced to take another birth. As he was at a higher spiritual level at birth itself, his foundation for spiritual practice was strong. From the moment he was born, this embodied soul has been chanting the Name of God at the level of the sub-conscious mind. At 12 years of age, Saurabh reached the 60% spiritual level due to his own internal spiritual practice. 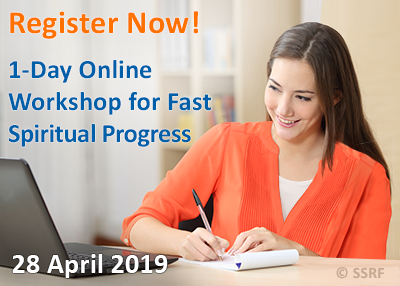 Refer to the tutorial – How chanting works? He even has a placating effect on quarrels at home. Whenever there are stressful vibrations he begins to laugh, talk and does various mudrās or hand gestures. This automatically diffuses the tense situation at home. Saurabh’s Sainthood was declared on 2 September 2013. Saurabh doesn’t have body awareness and is completely dependent on others for His needs. He cannot even turn on His side. Having slept in one position since His birth, He suffers from unbearable pain and cannot express it. Still, He is always in a blissful state.